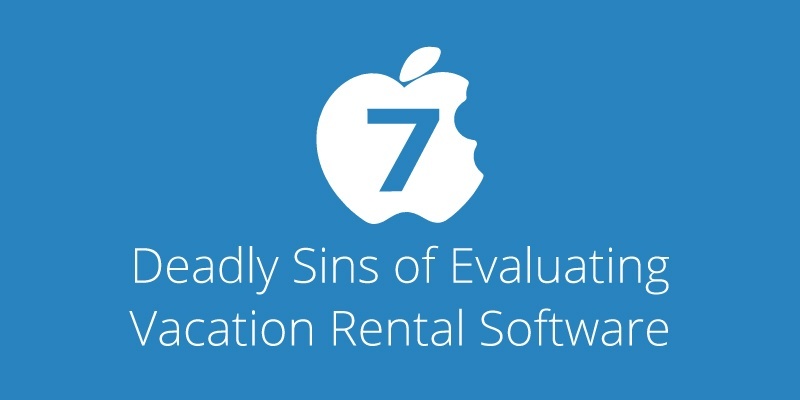 If you’re shopping for vacation rental software, don’t commit these common sins of omission during the process (including sin #8 – not reading this post). Let’s face it, when most people shop for vacation rental software, the top things on their checklist are features and price. And, sure, price and functionality are vital considerations, but if these are the only things you evaluate during the buying process, you could be setting yourself up to fail. At LiveRez, we’ve been around long enough to see some of the biggest mistakes people make when evaluating software. That’s why we put together the list below (which we’ll get to here shortly). But first, it’s critical to understand the consequences of not doing your research. For us, it’s always a bittersweet moment when, six months to a year after losing to a competitor, you see a familiar face in the lead queue. It’s a manager that didn’t do their homework and now they’re scrambling to pick up the pieces and looking for help fast. The same goes for someone who you thought had communicated everything they wanted, you overcame all their obstacles, and identified them as a great fit for your product – just to find out they failed to communicate a major need. And now, after you both have dedicated a lot of time and effort to the implementation process, they discover they have an immediate need for something new you can’t develop overnight. It’s not great for either party. While there will normally be a few minor issues to work out with any new software, you can avoid the major ones by doing your homework upfront. Do your due diligence, and you’ll be in heaven. Commit one or more of these common, deadly sins of software evaluation, and you could end up somewhere else. There’s a big difference between a company that is privately owned and one that is owned by a parent corporation or that is partially owned by a venture capital firm. Why? Parent corporations (especially if they’re public companies) are going to be highly focused on profit margins. They have shareholders to please after all. If the software they are selling is just a small fraction of their overall business, they’re going to be less likely to pump resources into it. Many times they’re buying the company because of how it fits into their main line of business, and will most likely focus on using their new asset to enhance that side of their business. Venture capital firms are going to be focusing on growth first, and then profitability. And eventually, they’ll be looking for an “exit” of some sort, either selling to a larger corporation or, in some instances, going public. In this situation, you’ll likely see some sort of promotional introductory pricing to help the company spur its growth initially, but over time you’ll see the strategy evolve to implanting tactics that drive profit. These firms need their winners to win big, to subsidize the bets they make that don’t pan out. As a company, when you take money from venture capitalists, you are in many ways beholden to them. And, if they’re good at what they do, they’ll want you to take actions that drive growth and profits – but that’s not always in the best interest of the people using the software. LiveRez CEO Tracy Lotz talks about the value of funding your business with revenue. Privately owned companies follow their own path. It allows them to make decisions independently, based on what they think is best for their long-term success. The drawback to privately owned companies is that they may lack the resources of a larger organization. Early on, there’s a chance they could fail. But, once they establish themselves, become profitable and lower/eliminate any debt they are carrying, they can be a dependable long-term choice. This is another great question to ask. It’s important to find out how many years the company has been in business. Are they brand new and in the “make it or break it” phase? Are they an established company but stagnating in terms of growth, happy just to cut overhead costs and milk their current client base? Or, are they established and still growing? If you’re depending on this company to offer ongoing product support and continual development, it’s good to know how many resources they have at their disposal. Are they running a bare bones operation? Or, do they have the manpower and talent to not only be sustainable but continue to grow? What is my responsibility during implementation? What data can you transfer for me? How long does a typical implementation take for a company of my size? Will I have a dedicated project manager throughout the process? Switching to a new software is going to come with a learning curve. And, while you’ll probably get a good amount of training during the implementation process, you’ll most likely have a few issues pop up over time. That’s why it’s really important to understand how the company’s customer support works. LiveRez invests in hiring the best people for its partner support teams. Seen here is our core support team. We also have a team of implementation project managers and a partner success department staffed with team members that previously worked as professional managers themselves. Which types of support do you offer (phone, email, chat, online)? Do you have a help center with training and troubleshooting articles and videos? What are your regular hours for phone and email support? How can I get ahold of someone after hours in the case of an emergency? Do you cap your support hours? How responsive are your support agents? What is the typical call back time? Solution time? How many people do you have on your support team? Are your support specialists in-house or do you outsource them? You wouldn’t want to build a house on a faulty foundation, would you? Then, why would you want to build the future of your company on a piece of technology whose core foundation is old and outdated? Now, when it gets into software backend technology, it can get really confusing, really quick. Not all of us speak “nerd” fluently, others not at all. But, it’s important to beef up on your knowledge here, because the technology a company builds with can make a big impact on their future. What technology is their system built upon? And what version do you utilize? Newer companies may be built on newer technology, but have had less time to build features. Older companies may have more features, but haven’t taken the time to update their back-end technology, essentially hindering their ability to adapt to new needs and leverage newer forms of technology. Updating the framework of your software is not easy. It’s almost akin to updating the foundation of a house. When you have a lot of code sitting on top of it, there are risks involved in making the update. But, forward-thinking companies that want to be relevant and cutting edge will see past the struggles. Anymore, there is virtually no excuse to switch to a software that isn’t cloud-based. All the newest and greatest software systems in the industry are cloud-based. But, as you move to the cloud, you want to understand the reliability of the software and the care the company takes in securing your data. Going back to the previous question, you also need to understand that even though cloud-based software is a newer concept that’s evolved over the past 10 to 15 years or more, not all SaaS technologies are equal. If the company is still utilizing the same framework they built the software on 10 or even 15 years ago, there’s a strong chance it could limit them down the line. Does the software work across all browsers? Surprisingly we’ve seen certain softwares in our industry not work on certain browsers. In fact, until recently one of LiveRez’s biggest competitors was selling a cloud-based product that only worked on Internet Explorer (which is a big problem if you’re a Mac OS user). Before you buy a software, make sure it works correctly on all the browsers you use. In some cases, you may need to upgrade to the latest version of your browser (which is something you should be doing anyway, and it’s nearly always a free update). Is the software accessible on mobile devices? The trend in cloud-based software design is mobile-first, meaning that designers ensure that if they are going to design something new it works on even the smallest of smart phones. Most of the new software systems will build mobile responsive technology that dynamically adjusts to display correctly on any device, or throw in a have a companion native app you can download from the iTunes store or the Android Market. Some software systems are partially mobile responsive, meaning some of the newer features they’ve built work well and display correctly on mobile devices. In the end, it’s up to you to decide which parts of the system are most important to you to be mobile. For example, any guest facing technology will probably need to be mobile responsive, as well as any technology your team will need to use in the field. Are they re-investing in their own technology? This should be another big consideration for you. It’s extremely important that the company you choose is reinvesting in building out their technology. The last thing you want to do is partner with a company that is stagnant, and happy just to “milk their base.” These are the companies that merely support their current offerings without investing much, if anything, into building new functionality or expanding existing functionality. This also relates back to the first question posed in this section. Is the company investing in keeping their framework up to the existing standards? Are they investing in learning new types of technology, like Angular or NodeJS? Are they paying to provide continuing education to their development teams? Who is building the software? How many developers do you have in house? This is something a lot of people overlook. You’ll want to know how many, if any, in-house developers the company has on staff. It may sound crazy that a software company wouldn’t employ any software developers, but with the proliferation of outsourcing nowadays you’d be surprised at how much work gets sent overseas. LiveRez employs a large team of in-house developers. Every year, they stand up in front of our partners at our annual conference and represent the work they've done. Seen here is just a few of our engineers at our 2015 Partner Conference in Sun Valley, ID. Outsourcing can be a great way to save money, but having people in-house allows you to be responsive during emergencies and gives you a team that has intimate knowledge of your code base. Not to mention, if you plan on partnering with another company through an API there could be communication issues. And, maybe it’s just us, but we wouldn’t feel comfortable sending potentially sensitive information to countries like Russia or China (given all the security breaches we’ve seen recently). That’s why 100% of our developers are full-time, in-house employees that are US Citizens, with the rare exception of allowing an amazing developer to work remotely if extenuating circumstances dictate that they need to move away from Boise. Just as the needs of your guests and owners change with the times, your needs will also change with the times. In fact, the changing needs of your guests and owners are probably a big factor in your decision to switch software. And, similar to how you are adjusting to their needs, you’ll want to find a software company that can adjust to your changing needs. That’s why it’s paramount that you partner with a software provider that’s committed to staying ahead of the curve. You don’t want to get stuck with a company that’s stagnant and keeps you from staying competitive. How often does the company update its software? Any growing software company will update its software often. You should be seeing at least a few updates every month and some big initiatives finished every year. What are their big initiatives? Every good software company will have a few big projects on their roadmap. While some companies will undoubtedly want to keep these project close to their chest, others may be more transparent on what they have on the roadmap. One way to understand how active a company is when it comes to releasing major (or even minor) pieces of new functionality is to look into their past development patterns. How many big ticket items did they release last year? The last two years? How responsive are they to fixing issues? No software company is perfect. Every company is going to have issues. A good software company will be responsive in fixing bugs that keep their customers from accomplishing their goals. If the company is working on a number of big projects, they may not have time to deal with every little enhancement request, but a good company will know how to prioritize which issues are most important. Are they involving their customers in the development process? The end goal of any software is to solve problems for its users. If a company develops a new piece of functionality that doesn’t accomplish that goal, they’ve essentially wasted valuable resources. One way to mitigate that problem is to keep your users tethered to the development process. Now, when you have hundreds or even thousands of users you won’t be able to involve everyone. But, you can involve certain segments of that group. And, you should be able to gather ideas from the larger group as well. LiveRez VP of Product Brian Sevy whiteboards ideas with one of our partners. LiveRez regularly involves its partners in the development process. At LiveRez, we have multiple advisory boards of our current partners that serve two-year terms. They help us prioritize what to develop and give us feedback on our major initiatives through all stages of development. We also have an online community where our partners can not only make suggestions but also talk with each other about how they use the software or run their businesses. If a software company is still growing, they probably have a roadmap of what they’ll be developing the next quarter, next year or even next 18 to 24 months. But, a roadmap is only valuable if the company can execute it. In the world of software development, all sorts of things can come up that affect when (and if) a roadmap item gets completed. Maybe an earlier roadmap item took extra time to complete. Maybe there was a new business need the company needed to prioritize. Maybe the company’s clients’ needs changed. If the item depended on a partnership between two companies (like an API integration), perhaps the partner company faced a roadblock during the process, needed to re-prioritize their own roadmap, or couldn’t come to a solid business agreement. LiveRez VP of Operations Tina Upson trains partners on our new trust accounting system during the 2016 Partner Conference. Even though she's busy running the day-to-day operations of LiveRez, Tina personally goes the extra mile to make sure partners are successful. So, while understanding what a company has planned is always an important consideration, it shouldn’t be the primary reason you make a switch. The proof is in the pudding, not in the promise. One way you can evaluate a promise is to look at how quickly (and how accurately) the software company delivered on past promises. Was the feature done on schedule and did it work as intended? You might not be able to gather this from the sales person you’re working with, but you could likely learn more by speaking with current and former users of the software. When you’re looking at switching something as critical as the software you run your business with, you don’t want to just take the company’s word for it. Just because the salesperson tells you something or the company has something listed on their website, it doesn’t mean it’s always the case. This is especially true with more subjective items like support, implementation and success metrics. That’s why it’s important to talk to current users of the software. They’ll be able to tell you how responsive the company is to customer’s needs, how they deliver on their promises, and how well the software solves the customers’ problems. While you’ll never have time to talk to every client of every software you’re looking at, you should probably talk with at least a few clients from every one of the companies on your short list. LiveRez partner Joan Bird of Snow Escape Holidays in Australia speaks out at recent partner event. Our partners' input is extremely important at LiveRez, as it helps us guide the direction of the company. You can also learn a lot from online reviews. These can give you an at-a-glance view at how actual users of a software feel about the system and the company behind it. You’ll need to take these with a grain of salt, too. Some of the great reviews could have been solicited. Some of the really bad reviews could only tell part of the story (as many of you already know with your own experience with online reviews from guests and owners). The important thing here is to familiarize yourself with the company’s reputation among its current and past clients. Always, always, always read the contract carefully. You should never expect a software company to make an exception or let you out of a contract that you supposedly read and have already signed. If there’s not some sort of a money-back guarantee, don’t expect a refund if you’re unhappy (although many good companies will give you one if they truly failed to deliver on the contractual items). Make sure you understand their pricing in and out. Are there hidden fees? Are additional services required to be able to utilize the system? Are there service plans that are optional (but really crucial) for you to be successful? Do they cap your support hours or charge you for simple updates? Additional fees can add up quick, and should be evaluated as part of the total price of the software. All of these details should be outlined in the contract. And, it’s up to you to read it thoroughly, ask questions, get answers, and, in some cases, even seek the advice of your legal team to thoroughly vet the contract. Remember, no matter how much you trust the salesperson you are dealing with, it’s up to you to clearly communicate your needs and ensure the software (in its current state) can meet those needs. Most salespeople are trained to not identify the downsides to their system unless you specifically ask about a feature they are lacking. Looking to Upgrade Your Vacation Rental Software? Since 2008, more than 1200 professional management companies have chosen to partner with LiveRez for their technology needs. If you’re looking to upgrade your vacation rental software and are interested in LiveRez’s all-in-one platform, give our team a call at (800) 343-2891. We’ll take the time to walk you through every step of the process and answer your questions. And, if for some reason you don’t seem like a great fit for LiveRez, we’ll let you know and can even recommend a system that may be a better fit for your needs.